Muscular dystrophy is a group of diseases that cause progressive weakness and loss of muscle mass. Abnormal genes interfere with the production of proteins that are needed to form healthy muscle. Muscular dystrophy symptoms can vary depending on the type and severity. Symptoms may include poor balance, frequent falls, difficulty walking and limited range of motion. The most common muscular dystrophy type is Duchenne muscular dystrophy. Some individuals with muscular dystrophy may require power mobility to maintain independence. A patient with muscular dystrophy should be fitted for an electric wheelchair that is compatible with a variety of seating, positioning and electronics components, so that the power wheelchair can continue to meet the user’s needs as his or her condition progresses. The Edge 3 power wheelchair is adaptable, expandable and is available with iLevel® power adjustable seat height, allowing users to elevate up to 12 inches while driving at 4.5 mph. iLevel’s Extra Stability Technology® enhances safety for completing Mobility Related Activities of Daily Living (MRADLs), such as reaching, cooking, grooming, toileting and transferring. The Edge 3 motorized wheelchair also comes standard with LED front and rear fender lights, allowing users to see and be safely seen while crossing streets or parking lots. 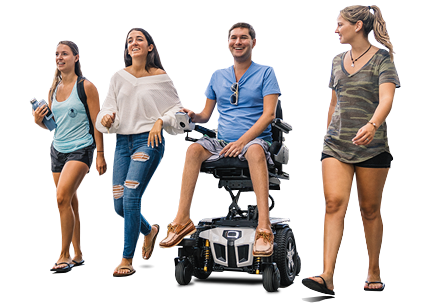 As muscular dystrophy symptoms progress, patients may require power positioning on his or her electric wheelchairs to help maintain proper positioning, comfort, skin integrity and function. TRU-Balance® 3 Power Positioning Systems on motorized wheelchairs are highly adjustable and offer an array of options including power tilt, power recline, power tilt and recline, power articulating leg rests, power articulating foot platform and iLevel. TRU-Balance 3 provides an appealing look and feel and maximizes functional independence. Depending on the muscular dystrophy type, a patient may require expandable electronics on their electric wheelchair. Q-Logic 3 Advanced Drive Controls allow operation of a power wheelchair using a joystick. Standard with Bluetooth®, Q-Logic 3 allows an individual with muscular dystrophy to operate his or her smart phone or tablet using the Q-Logic 3 screen. Q-Logic 3 can also be customized to include alternative drive controls such as a chin control, head array or switched driving. Individuals with muscular dystrophy may benefit from Stealth Products® wheelchair cushions. Each cushion provides a different function, such as general use and skin protection and positioning.